Crazy Eights is a shedding-type card game for two to seven players. The object of the game is to be the first to get rid of all the player's cards to a discard pile. The game is considered a pre-extension of Switch and Mau Mau, much favored in schools during the 1970s. A standard 52-card deck is used when there are five or fewer players. When there are more than five players, two decks are shuffled together and all 104 cards are used. There are many variations of the basic game, and a number of different names including Craits, UNO, Last One, Mau-Mau, Pesten, Rockaway, Swedish Rummy, Switch, Last Card, Screw Your Neighbour, and Tschausepp. The name Crazy Eights dates to the 1940s, derived from the military designation for discharge of mentally unstable soldiers, Section 8. Bartok, Mao, Quango, Zar, Taki and UNO are more extreme variations, containing elements not covered in this entry. Eight cards are dealt to each player. The remaining cards of the deck are placed face down at the center of the table. The top card is then turned face up to start the game. Players discard by matching rank or suit with the top card of the discard pile, starting with the player left of the dealer. If a player is unable to match the rank or suit of the top card of the discard pile and does not have an eight, he or she draws cards from the stockpile until getting a playable card. When a player plays an eight, he or she must declare the suit that the next player is to play; that player must then follow the named suit or play another eight. Typically the game doesn't take very long, but its time frame can vary greatly. Scoring varies depending on the weighting of special cards. Points are incurred for any cards left in the opponents hand at the end of a round. Traditionally, pure Crazy Eights is scored 50pts for an eight, 10pts for a face card, and face value for a spot card. These points are then awarded to the winner of the round. The winner of the game is the first player to reach a specific amount of points. For two players it is 100pts, three players 150pts, four 200pts, five 250pts, six 300pts and for seven players 350pts. In some variants, a player who cannot discard need only pick up one card before the turn passes to the next player. In this case another variable rule is whether or not a player picking up a card that could be played is allowed to play it immediately or not. 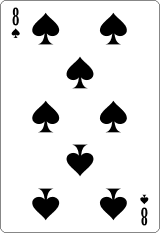 In other versions, the suit-changing card may be a different card (often Jacks or Aces), and rules vary as to whether the card has to be played on a matching suit (that is, 8♥ cannot be played except on a heart) or whether it can be played regardless of the top card. In some variations the players may agree to the "Dealer's Goodies" rule, in which the dealer is allowed to take the first discarded card if it is a "special" card, and continue taking cards until an "ordinary" card surfaces. Sometimes it is obligatory to call out "last card" if the player has only one card remaining. If he fails to make this call and is spotted, he may be obliged to pick up four cards as a penalty. Another variant requires that if a player's last card is an Eight, he must reveal this to the other players. In some variations, any number of cards of the same rank may be played consecutively when discarding, and in others, the players may choose to hold on to the wild 8's cards if so they choose. In some versions runs (e.g. playing the three, four and five of a suit together) are permitted when discarding. Another version allows for the top card of the discard pile to be removed and the remaining cards in the discard pile are reshuffled and serve as a new stock pile when the stock pile has run out. Some players require that in order to win, the player must run out of cards and finish on an "8". In another version the winner is the player with the fewest points. In the variation known as "Domineights", multiple cards can be consecutively discarded if each card is either the same rank or the rank directly above or below the previous card discarded. For example, if the top card of the discard pile is 4♥, the player could discard a 5♥, then a 5♦. The player may continue until the card discarded is not within one rank of the previous or until the player announces that he or she is finished the turn. Skip - The next player in the rotation is skipped. If more than one card is played, the appropriate number of players are skipped. Skip cards are often Aces. Players may agree that the player being skipped may cancel this by playing a skip card himself ("Skips on Skips"); in this case the next two players are then skipped. A similar option exists with draw cards, where 2s and the Queen of spades may be played on each other interchangeably if players agree on "Draws on Draws". Reverse - Players may agree that play reverses direction when a Queen or joker is placed down. Additional properties of 8 - The player who plays an 8 can force the next player to play a card of a certain suit. In addition, playing an 8 cancels out any draw cards that would ordinarily be required. Some variations allow or require the player to play an extra card on top of the 8, thus setting the next suit. This changes strategy slightly, as the 8 becomes a more valuable card when a player cannot otherwise play, but less valuable as a tool to "block" the next player by trying to call a suit the other player does not have. Sometimes eights are allowed to make a person draw eight as well as letting the eight player change the suit. Draw Cards - When a draw card is played, the next player must take a number of cards from the pack. There are two basic draw cards: the 2 (draw 2) and the Ace (draw 4). If the next player can play another draw card, they add up and the third player must draw the total, unless he or she also has a draw card or an 8. Playing more than one draw card simultaneously will usually require a draw equal to the sum of the cards (i.e. three twos = six cards). Some players use black jacks to require the draw of five cards, and allow red jacks to cancel the draw. After drawing, the drawer cannot drop a card until it is their turn again. Some players, play the queen of spades to pick up 5. Also, when two tens are played at the same time the opponent picks up one card from the pile.The king of diamonds can cancel the queen of spades draw five move.Eights (as you have read)can be played to make the next player to draw eight as well as skipping the player.The player who played this card can still choose what suit to play. In some variations, players may play red jokers on hearts or diamonds and blacks on spades or clubs. Jokers are "wild" cards in this variant. For example, if a six of clubs is played a, black joker can be played if the player does not have a six, club or eight. The next player gets to choose whether it is clubs or spades. When drawing from the stockpile you must always pick the first card that you can play. Some specific variations exist, which vastly alter the strategy used from the above description. Multiple cards of the same rank can be played at once, this is referred to as "burning". All 2s played in this manner stack. Example: Playing 4 2s causes the next player to pick up 8 cards. A player does not have to play a card if they do not wish. This allows the possibility of picking up extra cards if one desires. Example: A player may wish to act as if they cannot play after being forced to pick up two cards, and pick up a third card in order to try to extract another 2 from the pile to punish their opponent back. This also allows for strategic punish card play. Example: A player holding more than one 2 may wish to "hold-back" one or more 2s if they think their opponent may also have a 2. As 2s add together when played, this will force their opponent to net more cards than if they had been played all at once. If a player possesses an Ace, they may declare "Ace Unload" while placing the suited ace on top of the pile. They may then lay down or "unload" all cards they hold within that suit on top of that ace. Example: 6-H is played, the following player can play A-H while declaring "Ace Unload" and then lay down the rest of the hearts in their hand. The "burn" rule can also be played on the top card following an ace unload. If a player cannot or does not want to play a card, they must pick up one card from the pile. If after picking up they still cannot or do not want to play, they must pass. If the stockpile is out of cards and a player cannot or does not want to play, they must shuffle the discard pile and put it back into play, leaving the top card of the discard pile visible. When a player has only one card left, they must declare "Last Card", if they fail to do so, an opponent may order the player to pick up 2 (or sometimes up to 5 or even 8) cards. The loser of each game must shuffle and deal the next game. The "skip" card mentioned above in the general rules is typically any jack; the "reverse" card mentioned above is typically a king. Playing a 2 'stacks' as in traditional rules, and playing a 2 in response to a 2 negates drawing cards. The 4 will change direction of play (from clockwise to counterclockwise or vice versa). The queen of spades is pick up 5. The queen of spades may stack with 2s in some versions; in others it may stack only with the 2-spades, in accordance with the normal rules of play. In some decks specific to Crazy Eights, The queen of spades may be marked with cut-corners. When a 2 is played when the cards are dealt, the next player must pick up 2. Playing an Ace reverses the direction of the order of play; in a two player game, the other player skips a turn. Playing a 2 means the next player has to draw 2 cards; unless the other has a 2, in which case s/he may opt to play the 2, causing the next player to draw 4 cards, unless that player has a 2, etc. Playing a 7 means the player may play another card. Playing an 8 means the next player has to skip a turn ("acht = wacht"; "eight = wait"). Playing a Jack means the player declares a new suit (so, if the player plays a diamond jack, and calls spades, the next player can play any spade, any jack, or a joker). Rules differ on whether a Jack may be played at any time, or only when it matches the current suit or rank. Playing the Joker means the next player has to draw 5 cards. The next player may play any card. The joker is usually allowed to be played any time, but variations exists that it may be played only when the player has no other card matching the current suit or rank. In Solitaire-Crazy Eights, most rules do not change, but the way cards can be played is drawn from the card game Solitare. The game starts out like the Canadian variation, but there are some specific rules that make the version unique. If a player has a partial suit of cards, he or she can play all of that partial suit if the cards are in order. It does not matter what the starting card is, as long as it does not violate the rule. A player can also play four cards that are of all four suits and are all the same number, but can only do this if he or she has all four cards. A player can only use the first two rules if it will not immediately result in he or she winning the hand. A player can decide to pass on a turn if he or she has drawn five or more cards that are of no use to that player. Any 8 will change the current suit to the players choosing. They can be played on ANY card. Multiple 8s can be played at once. Eights can make the next player draw eight. A Jack (J) skips the turn of the next player. In a two-player game, this acts as a "play-again" card. A Queen (Q)will reverse direction of play. In a two-player game, the 4 has no special action. Playing a 2 will force the next player to pick up two cards, unless that player can play a 2 themselves (forcing the next player to pick up four cards), or can play a 5 of spades (which will force the next player to pick up seven cards). Playing more than one 2 card will force the next player to draw multiple pairs of cards. The queen of spades forces the next player to pick up five cards. This cannot be played in response to a 2. If the queen of spades is played with other queens in the same discard, the next player still must pick up five cards, regardless of if the queen of spades is the top card or not. If any special action card is turned as the first card at the beginning of the game, play proceeds as if the dealer played the card. If an 8 is turned as the first card at the beginning of the game, it has no special action. A joker can be played if a player doesn't have a certain card. The next player gets to choose what colored suit the joker is. Hearts and diamonds for red and spades and clubs for black jokers. The king of spades can cancel the queen of spades draw five move. Aces are used to skip sometimes. Another version of the game is "Crazy Eights Countdown" created by Christopher Obacz and Michelle Gillingham in 1990. It is usually played to extend the length of the game. Once a player is able to discard his/her first hand, the first game finishes. For example, if a person was dealt eight cards in his/her first hand and discards them all, he/she draws a second hand, this time with seven cards (thus 7 becomes his/her particular wild card). This goes on until a player goes down all the way to drawing one card and is able to discard that hand. Whoever does so wins. If a player is on 7's and it is wild for them and the other player is on a different number and player A(wild 7) plays a 7 to make it a different suit, player B(not on 7's) may play a 7 to change the suit to whatever the card's suit is. For "Naked 8s", the above rules apply; however, first 8 cards are dealt face up. All subsequent cards picked up are face down. If the discard pile requires reshuffling, all hidden cards are turned face up. Play then continues as before, with all subsequent cards face down, until the next reshuffle. Note that the advanced Crazy Eights player would already know what cards their opponent has at reshuffle (specifically in a 2-player match). This variation helps bridge the gap between advanced and amateur players. "Half Naked 8s" is a variant similar to Naked 8s, but only the first four cards are dealt face up. "Tag Team Crazy Eights" is played with 4, 6 or 8 players, and follows local rules. Players across from each other are teamed up. The goal is to have both partners of a team discard before the opposing teams to win. During the beginning of a player's turn, they may pass one card to their team-mate. The teammate may return the card, or trade it for one of their cards. Players cannot request any type or specific card, requiring their team-mate to guess the intention of the trade. Players with one card remaining may not trade their card. Team members collaborate to avoid unnecessary draws, stifle opponents and assist each other. Example: During a player's turn, they are aware the next player and opponent is on their final card. The player sends his partner an undesirable card in hopes of receiving a 2, black Jack, or Queen of Spades to prevent the opponent from going out. Players under Canadian rules might constantly trade cards to build sets of the same rank for burning. In some variations of Tag Team, when only three players remain teams are disbanded. Some variations require that cards are traded face-up, so other teams may see the contents of the trade.